“16th January 1917. I can see no excuse for deceiving you about these last four days. I have suffered seventh hell. I have not been at the front. 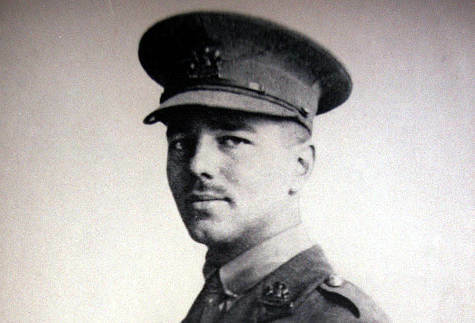 I have been in front of it….” (from: Wilfred Owen: Collected Letters, H. Owen and S. Bell [Eds. ], 1967). As one of the leading poets of the First World War, Wilfred Owen’s verses are perhaps to be expected here. No need thus to talk about Owen’s own life, poetry or literary legacy in relation to the emerging English Modernism. We rather suggest one of his most renowned poems Dulce et Decorum est. Entitled with the famous Horace’s Quotation (Odes, III.2,13) – almost a “manifesto” of some nationalistic propaganda from the classical Age up to now – the poem spares the reader none of the grim details of the trench life during WWI and lets so the patriotic rhetoric of this “old Lie” collapse in front of the physical and psychological suffering of the soldiers.